Along with great skin, beautiful hair is a standard of beauty. When you suffer from hair loss, it can have a tremendous effect on your confidence and self-esteem. Because hair loss is not an actual disease or life-threatening, most people, especially in the medical field, often regard it as a trivial problem. However, the psychological effects of thinning hair can cause an individual to have troubled relationships, low productivity at work, and reduced quality of life. There are several ways to cure hair loss – from natural methods to prescription drugs, and even surgery. If you’re looking to find that one solution to your hair loss problems, then you’ve come to the right place. But first, let’s understand what hair loss really is, and the roots of the problem. When you’re in your 20’s, you probably would never even think about hair loss. But as you age, however, you’ll start to notice a gradual change in the way you look, which could be a result of thinning hair, a receding hairline, or patches of hair loss that make you look older than you really are. You probably wouldn’t think of ways to prevent hair loss unless it runs in your family. So if you’re reading this, you’re probably looking for the best possible treatments that could give you the head of hair that you used to have. Lasers – laser devices are used to emit laser rays applied to the scalp to stimulate inactive hair follicles. Topical Creams – a good example of a topical cream that improves hair growth is Minoxidil, which is an FDA-approved medicine that comes in liquid or foam form. You basically apply it on your scalp and wait for your hair to grow. Supplements – some types of hair loss are due to a poor diet, and if this is the cause of your problem, then supplementing with the right nutrients can help to improve hair growth. Hormone Help – this method is ideal for those whose hair loss is caused by hormone imbalance. Cortisone Shots – these injections have been known to reduce inflammation on the scalp, as well as blocks the activity or hormones that cause hair thinning. Hair Transplant – a type of surgery where healthy hair follicles from other parts of your body are used to replace follicles that are no longer producing hair on your scalp. Managing Stress – when you’re emotionally and physically stressed, your body reacts in many different ways. Hair breakage, falling out, and general hair loss are major symptoms of stress. Managing stress levels can help to reduce hair loss. One of the most recognized names in the hair growth industry is HairMax, a hair loss breakthrough that is backed by clinical studies and supported by FDA clearances not only for safety but also for effectiveness. 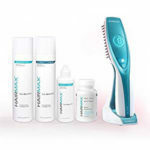 The undisputed leading name in hair-growth technology for home-use, HairMax features their state-of-the-art and absolutely effective laser devices that give you safe, non-invasive, and genuine solutions for healthy hair growth. Founded in 2000, the company has helped millions of people across the world to stimulate hair growth so they can regain their confidence and finally live life to the fullest once again. The company enjoyed having the first ever FDA-cleared medical devices for home-use in hair growth and treatment for both men and women. A comb that emits low levels of laser, which is UVA light, to stimulate hair follicles. It improves the action of the the adenosine triphosphate, which is a molecule that tells cells to do their job. The comb is moved slowly over your scalp, where you have to hold it in one place over 4 seconds, then continue to move around until your entire head is covered. The comb emits a sound that tells you it’s time to move to another spot. This band looks like headphones and you put it on like a headband over your head. You basically “wear” the band by placing it in front of your head, then slowly moving it gently to the top of your head and to the back, doing it over again for 90 seconds. You hold the band in place for about 4 seconds before you move it to another spot. The lasers or light rays emitted by these devices are UVA light, which is similar to that of sunlight. The LaserComb is an innovative device that contains parting teeth that make it more effective than other laser combs in the market. Hair is actually a protectant, since it blocks out the rays of the sun from your scalp. 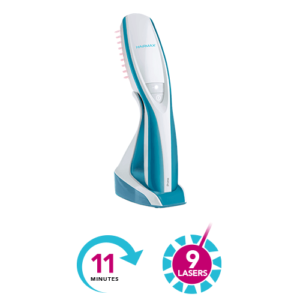 The LaserComb’s parting teeth mechanism parts strands of hair to ensure your scalp is actually reached by the laser and not just the surface of your hair. Men’s hair goes through a lot every day, so it’s important to make sure that it is ready for anything. But the hard truth is that no matter how much you care for your hair, there is one thing that most of us can’t control: hair loss. This problem may be a result of several factors like your genes, a recent bout with stress, or even a bad haircut. Either way, it’s not something that’s easy to fix. With this problem in mind, HairMax has come up with a product that is both effective and easy to use – the HairMax LaserBand 82 Hair Care Bundle. What is the HairMax LaserBand 82 Hair Care Bundle? Like its name suggests, it is a set of 5 innovative products bundled together to make a complete kit to fix your hair loss dilemma. The most important feature of this bundle is Hair Max LaserBand – a medical device that is clinically proven to reverse the hair loss problem by using laser light technology. And the best thing about it? It’s hands-free. It comes in the non-threatening appearance of an ordinary headband and also works in the same way. Simply place the LaserBand 82 at the hairline and leave on for 3 minutes. Move the device to the middle of the scalp and leave on for the same amount of time. Do the same process for the back part of the head. Repeat this process three times a week. 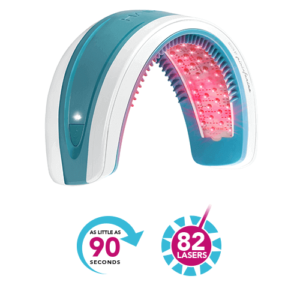 The LaserBand 82 has 82 medical-grade lasers that emit nourishing light energy directly onto the hair follicles. Each individual laser beam stimulates hair follicles by helping them regain their natural growth cycle or anagen phase. This process is called PhotoBioStimulation. It carries energy to the cells in your scalp to promote hair growth, giving you longer and thicker hair. With only three treatments per week, the LaserBand stimulates the hair follicles to promote new hair growth, grows thicker and fuller hair, and prevents any further hair loss. It is also FDA-approved and medically tested for safer results. Density Shampoo – contains powerful DHT blockers and antioxidants to fight hair loss. It is a low PH level solution, meaning it is safe and gentle on the skin. It is specially formulated to increase hair and improve its thickness and fullness. Density Conditioner – contains Argan oil, moisture-locking polymers and several plant extracts. It works by hydrating the hair strands to trap in moisture so that hair grows stronger and fuller. Density Revitalizer – contains powerful exfoliants to cleanse the scalp and remove excess oils. A clean scalp is important because it prevents hair follicles from clogging. It also contains peppermint extracts so that you feel fresh after each use. Dietary Supplements – contains a blend of essential nutrients for healthy hair, including Biotin to increase keratin production in the scalp and Niacin for improved blood circulation. Because it is hands-free and easy to use, it is a perfect solution for men who do not have the time for long and complicated hair treatments. With the HairMax LaserBand 82, each treatment takes as little as 90 seconds. It comes in a portable and lightweight device that you can bring anywhere so that you can go on with your daily business without having to worry about your hair problems. It is ideal for both men and women, and is specially formulated to treat all forms of hair loss. 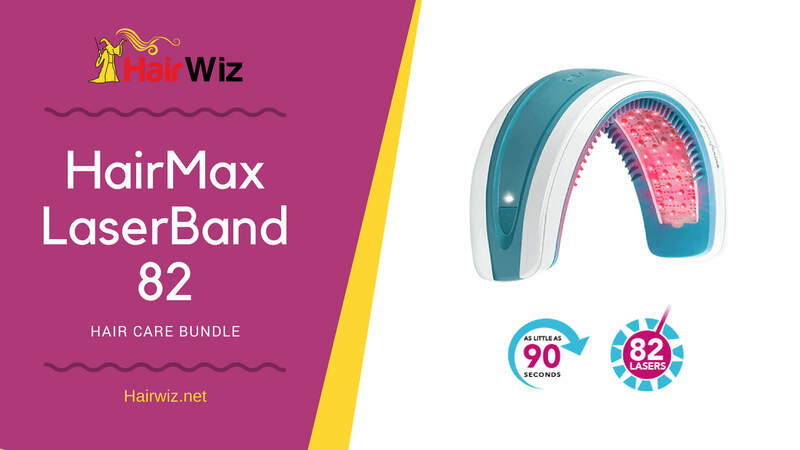 With the HairMax LaserBand 82 Hair Care Bundle, hair loss treatment has never been this fast and easy. By simply placing the LaserBand on your head, you get maximum results with less effort. Hair loss is one of the earliest signs of aging. But did you know that some men start having thinning hair as early as in their late 20s? Studies have shown that 50% of men will experience some degree of hair loss by the time they reach fifty and 2/3 will begin noticing symptoms before they reach the age of 35.For most, this is practically inevitable and can be traced to bad genetics. Natural remedies can only do so much. A surefire way to avoid this hairy situation is with the HairMax Lasercomb Professional 12. What is the HairMax Lasercomb Professional 12? The HairMax LaserComb Professional 12 is the only FDA-approved laser device to combat male pattern baldness due to hereditary causes, otherwise known as Androgenic Alopecia. On the outset, it is a product clinically proven and formulated after years of research to stimulate hair growth and prevent hair loss. The Lasercomb works by emitting a low level laser beam onto the scalp. Why does it carry the “Professional 12” description? Because each use delivers 12 individual beams of laser therapy to nourish and revitalize the scalp. It is used as you would an ordinary comb: run the device slowly through your hair for 8 minutes and repeat three times every week. Each individual laser beam stimulates hair follicles by helping them regain their natural growth cycle or anagen phase. This process is called PhotoBioStimulation. Similar to photosynthesis in plants, this process carries energy to the cells in your scalp to promote hair growth, giving you longer and thicker hair. Most people are not ready to try strong, powerful drugs to treat hair loss and hair transplants are not only risky but also quite expensive. The HairMax Lasercomb offers you a safer alternative to effectively help grow thicker and healthier hair. It is a non-evasive home device, meaning you can administer it by yourself from the comfort of your home. The moment your scalp is exposed to the nourishing light energy from the Lasercomb’s beams, the hair follicles are automatically enlivened and revitalized. This makes your hair grow stronger and is one of the most important parts of the regrowing hair because it reverses the thinning process so that thin and lifeless hair grows into thick and vibrant strands. The LaserComb stimulates, but does not create, new hair follicles. Thus, it is not recommended for those experiencing extreme hairloss. As with other hair loss solutions, every person reacts differently to the treatment. A lot of factors must be considered, like one’s age and overall health. 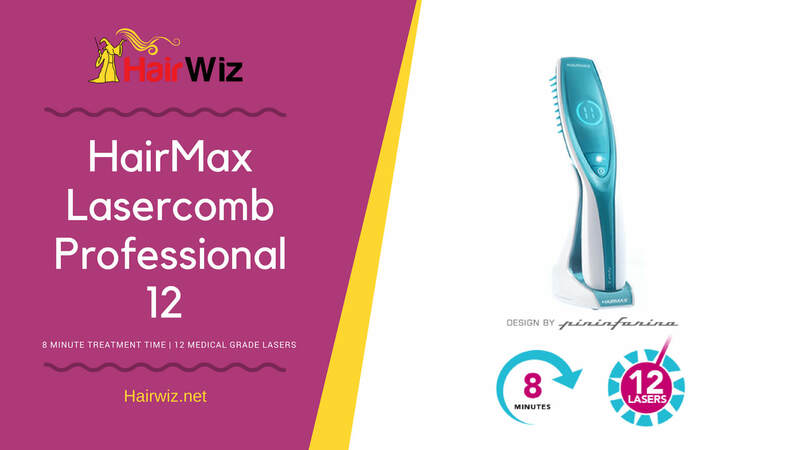 The HairMax LaserComb Professional 12 is suitable for both male and female hair. It is targeted mainly at strengthening damaged hair strands to help reclaim their natural strength and vitality. Because it is FDA-approved, it is highly recommended for first-time users who have recently had a bout with hair loss. It also boasts of fast and visible results (in as early as 12-16 weeks), so that it is a quick fix for those who want to regrow their hair faster. The LaserComb is also a perfect choice for anyone with a busy lifestyle because it is portable and can be used anywhere, whether at home or at the office. Unlike other hair regrowth treatments that come in serums or pills, the HairMax LaserComb is a non-evasive portable device that is both safe and effective and can be easily done from the comfort of your home. Hair treatment does not get any easier than this. With the HairMax LaserComb Professional 12, thick and vibrant hair is literally only a brush away. 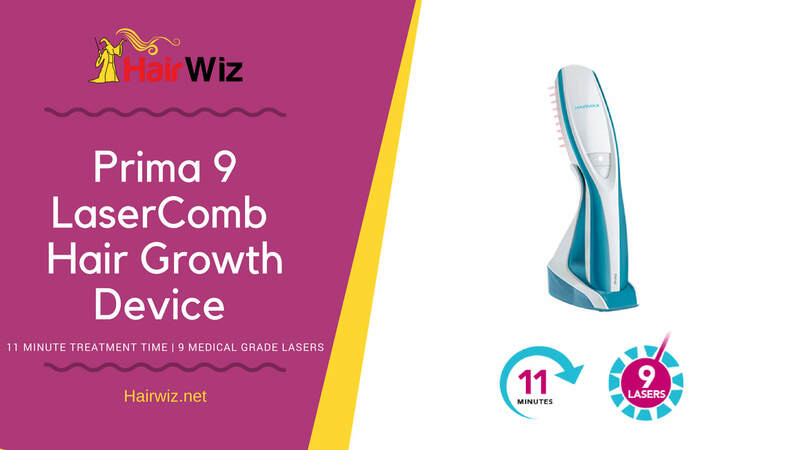 One of the latest models from the range of HairMax LaserComb devices, the Ultima 12 LaserComb is a revolutionary hair loss treatment solution that gives you 12 medical grade lasers for ultimate hair growth. The leader in laser comb technology, HairMax has revolutionized the industry of hair loss treatments, and this latest edition of laser comb gives you more coverage and the power to stimulate hair growth and prevent further thinning of hair. The Ultima 12 is a hair growth laser device that’s FDA approved for men and women who are suffering from genetic hair loss. It is one of only 3 products on the market cleared by FDA, and the first and only laser device proven to work efficiently to stimulate hair growth and prevent further hair thinning. Clinical studies involving the use of HairMax’s laser devices have confirmed that the device does indeed work to help patients grow a healthier head of hair in a matter of weeks or months of continued use. Ultima 12 uses therapeutic light energy through 12 medical grade lasers without the use of LEDs. These lasers are powerful enough to stimulate weakened hair follicles, as well as to improve blood circulation to the scalp. With more blood circulation comes more oxygen and more nutrients to the hair follicles, forcing them to become active and produce healthy hair. The device features the company’s unique patented parting teeth that parts strands of hair as you comb ensuring the scalp is visible and targeted. Photobiostimulation is achieved through light therapy, and its benefits include the increase of ATP, which enhances cellular metabolism and activity. Photobiostimulation also promotes keratin production, creating more hair that’s thick, more dense, and healthier. The Density Shampoo – cleanses hair thoroughly without stripping off essential oils; scientifically proven to restore balance, improve scalp health, and enhance hair’s vitality. The Density Conditioner – deeply hydrates and retains hair’s moisture for strong and protected hair. The Density Revitalizer – a scalp exfoliator that removes excess sebum, as well as removes product buildup that may inhibit hair growth. 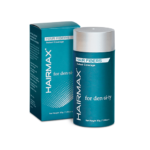 HairMax Daily Supplements – clinically proven to help hair regrowth, as well as improve the overall health of hair. Contains vitamins, minerals, and extracts. Clinically Proven and FDA-Cleared – this ensures you of genuine effectiveness and safety. 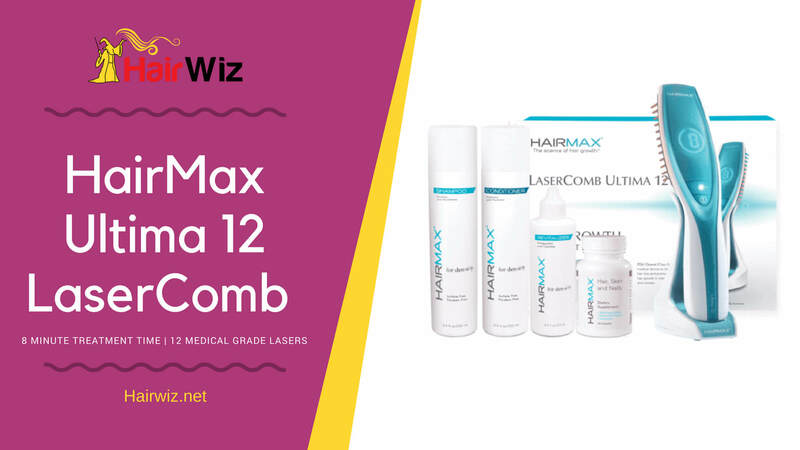 HairMax has conducted clinical studies that prove the LaserComb’s safety and effectiveness; making the device the first and only laser comb to be approved as one of only 3 products in the market proven to treat genetic hair loss for both men and women. Uses Medical Grade Lasers – the device is self-administered at home and easy to use. The lasers are completely safe yet powerful enough to improve hair growth. 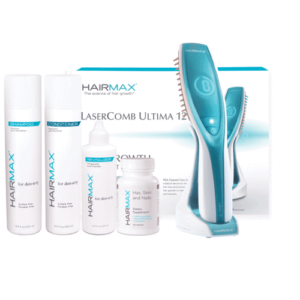 Uses 12 Lasers – with 12 lasers, the Ultima 12 is wider compared to the other HairMax Lasercombs. Because it is wider, it provides more coverage, lessening the amount of time you administer the device on your scalp. The wider the comb is, the more effective it is. No Ongoing Costs – unlike other hair growth treatments, there are no ongoing costs for the Ultima 12. All you need to do is recharge the device, and it’s all you’ll ever need for your hair growth treatment regimen. Product life is estimated at 10 years. It takes a Long Time to Administer – it requires you to glide the device over your head for 10 to 15 minutes per session, which is to be done three times a week. Takes a While to See Significant Results – The efficacy of the device depends on the individual – the cause of your hair loss, your current health, and your lifestyle. Results can be seen within weeks or months, not days. The device is ideal for men and women who are suffering from the early stages of genetic hair loss or also known as androgenetic alopecia. It is not okay for anyone who’s already suffered from complete baldness. It’s also an excellent addition to a preoperative or postoperative hair loss regimen. It also integrates well with other professional hair care products as it does not interfere with chemicals such as those present in hair loss creams and other topical solutions. 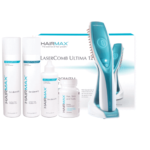 The HairMax Ultima 12 Lasercomb is a revolutionary device that’s easy to use and efficient. Though it may take some time to see significant results, it’s clinically proven and FDA-cleared, ensuring you that it has been proven to work and that it’s completely safe to use. If you have a hair loss treatment regimen, then the LaserComb is a fantastic addition that will hasten hair regrowth. When it comes to treatments for hair loss, there’s only a small number of FDA-cleared solutions. One of them is the HairMax Advanced 9 Lasercomb, a revolutionary breakthrough that changed the game in terms of hair loss treatments and solutions. This incredible device was the company’s first generation laser comb, and has spearheaded a new wave of hair regrowth products that target the very same goals. Using low level laser, the HairMax Lasercomb revolutionized the industry, and since 2011 has continued to change the lives of tens of thousands of people all over the world. The leading name is laser comb technology, the HairMax Advanced 7 Lasercomb helps stop hair loss in its tracks, and promotes hair growth for a thicker and healthier head of hair. Let’s take a look at its features. Anagen induction is the use of low level lasers to activate hair follicles that are resting into the active and growing stage. It does this through the process of Photobiostimulation, which stimulates the production of keratin and ATP for advanced hair growth. ATP stands for adenosine three phosphate, which is a coenzyme responsible for intracellular transfer of energy, as well as being know for stimulating living cells. Another way the lasercomb works is through improved blood circulation to the scalp. With improved blood circulation comes more oxygen supply to the hair follicles, as well as carrying more nutrients for healthier hair cells. The lasercomb was the first device to use low level lasers to promote hair growth and prevent further hair loss. It was the first and only device to be FDA-cleared as a treatment for hair loss for both men and women. In a clinical study wherein subjects used the lasercomb, 93% of them reported to have thicker and healthier hair, as well as the halting of hair loss. The device has also been clinically proven to revitalize damaged hair, improve hair density, stimulate hair growth, and reverse the thinning process. The HairMax Advanced 9 Lasercomb is ideal for both men and women. Most hair loss treatments target only men’s problems but this device can be used by both genders. Specifically, the device is most effective for those who are suffering from hereditary hair loss, or also known as androgenetic alopecia. Hair loss as a result of certain medical conditions, medications, and over styling are unlikely to be treated by the device. For anyone who wants to find an effective solution to their hair loss but without having to drink any medication, or have surgery, the device is a great option. HairMax promises hair growth of up to 20% on your scalp in as little as 12 weeks of use. If you are currently suffering from a medical condition or taking medication, please consult your doctor before you use the HairMax Advanced 9 Lasercomb. If you’re taking other hair loss treatments such as prescription medication, or using other hair growth products, please ask your doctor for possible interactions and safety measures. 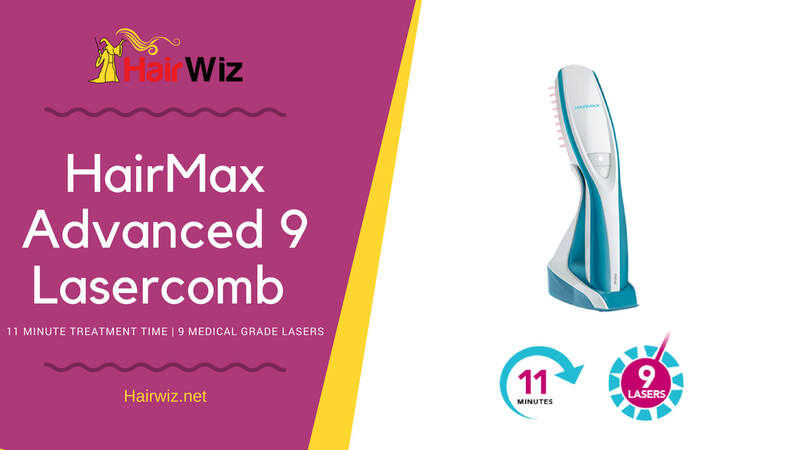 The HairMax Advanced 9 Lasercomb is the company’s first generation lasercomb, which changed the platform of hair loss treatments in the market. Before the Lasercomb, people’s options for treatment were limited to medication, topical applications, surgery, sprays, wigs, and the like. With the Lasercomb, people started to enjoy faster hair growth within a few weeks, as well as prevention of further hair loss. Although the lasercomb works over time (12 weeks), it is a safe, non-invasive, risk-free investment to your hair loss problems. Thinning hair is one of the most common problems among men. And if your hair is not as thick as it used to be, there’s a good chance you’ve already tried one or two products to keep what’s left of it. The problem is, with all the different products in the market, there’s no guarantee which one suits your particular hair problem. Some even go as far as to mix several kinds to get the result they want. But with the HairMax Prima 7 LaserComb Hair Care Bundle, you get all your hair treatment needs in one complete and easy-to-use package. What is the HAIRMAX PRIMA 9 LASERCOMB HAIR CARE BUNDLE? prevent any further hair loss. It is combed through the hair for only 15 minutes, 3 days a week. Aside from the LaserComb, this bundle comes with the Density Collection – a set of 4 hair products that are formulated with the highest quality ingredients to deliever unparalleled results. This collection includes: shampoo, conditioner, revitilizer, and activator. These four high performance products are specially formulated to help you win your fight against hair loss and thinning hair. Unlike other hair products on the market today, this bundle contains all the things every man needs for a complete hair transformation. This works by increasing the ATP and keratin production in your scalp to speed up hair growth. The laser beams also help increase blood flow throughout your scalp. Density activator – contains three DHT blockers to promote overall scalp health. Its nutrient rich ingredients help stimulate hair follicles to boost their natural growth cycle. Both the Prima 9 LaserComb and the Density Collection target thinning hair by enlivening hair follicles so that hair grows stronger and fuller. Stronger hair means less chance of breakage and effectively reverses the thinning process so that your hair’s natural growth cycle goes back to its natural rhythm. Expected results are seen within 5 months, but this may vary depending on several factors personal to the user. Not recommended for those experiencing severe hair loss and baldness. The best thing about this Hair Care Bundle is that it can treat all forms of hair loss arising from whatever cause. So whether you are experiencing early signs of male pattern baldness or suffering temporary hair loss due to increased stress, this product is the right fix for you. It is ideal for both men and women of all ages. It is also safe for those with colored hair or other hair treatments. Thin and lifeless hair leaves you feeling weak and unhealthy. It’s a situation that everyone wants to avoid and that you can easily get rid of with the help of the HairMax Prima 9 LaserComb Hair Care Bundle. HairMax’s laser devices work in the same way as photosynthesis does to plants. The lasers work through a process called Photo-Biostimulation. It uses the lasers to reach your follicles to stimulate hair production. Basically, the lasers bring oxygen and nutrients to your scalp, and therefore energizing and awakening weakened or dead hair follicles. How Effective Is Laser Hair Loss Treatment? On January 2007, HairMax became the only and first ever laser device to receive an FDA clearance as a treatment for men and women’s hair problems. Significant results are seen within 20 weeks of use, which tells you that HairMax is not an overnight solution to hair loss. Because hair grows at an average of 1/2″ per month, it would take several weeks or even months to notice the effects of the laser devices. The slow improvement tells you that it works naturally to speed up hair growth. As early as 12 to 16 weeks, though, you will begin to see improvements but ideally, 20 weeks is the needed time to fully enjoy the devices’ benefits. Clinical trials have shown that about 90% of all HairMax laser device users have reported significant increases in hair growth. Prior to the LaserComb and LaserBand, home-use hair growth products have been limited to topical creams and oral drugs that did very little to properly address the issues of hair loss. The devices have revolutionary changed the way people improved their hair loss conditions, as these are non-invasive and completely safe to use. In fact, in over 15 years, no reports of side effects have ever been reported. Used by both men and women all over the world, HairMax’s laser devices have provided proven hair growth that’s completely safe and genuine. Sudden or gradual hair loss can be a major problem to many people and knowing the root causes is key to knowing how to reduce hair loss for individuals. There are several treatments available for thinning hair, which range from over the counter topical creams, to prescription medication, to lasers, and even a complete hair transplant. Among the most common solutions for hair regrowth are surgery, prescription pills, and laser devices. But if you’re looking for a more convenient, accessible, and affordable option, several hair loss products are available. Let’s take a look at other hair growth products that can help you with your hair loss problems. If you don’t like popping a pill for your hair problems, then a safe and practical option are hair growth shampoos and/or conditioners. Hair loss shampoo treatments typically contain ingredients that help to inhibit further hair loss, but also promotes healthy hair. Conditioners work in the same way as thinning hair shampoos but their function mainly focuses on hydration and restoration of damaged hair. 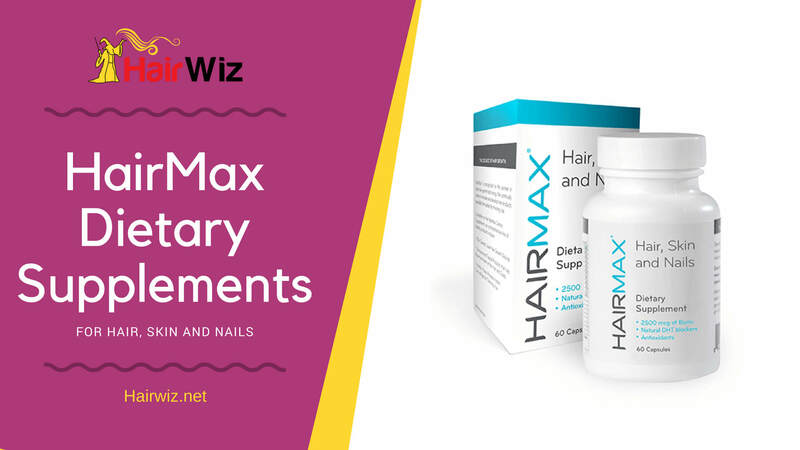 HairMax’s Density shampoo, and conditioner contains a synergy of ingredients that include DHT blockers and antioxidants that optimize scalp health, creating an environment for your scalp to produce healthier and thicker hair. While shampoos and conditioners do not exactly make hair grow faster, they do support other hair growth solutions such as laser devices and prescription medication that stimulate hair production. If you wish to continue using your favorite shampoo or conditioner, but want to have a supplementary treatment aside from laser devices, then hair activators are a great option. You simply spray them on your hair, and leave them on. They help support hair growth by stimulating hair follicles. 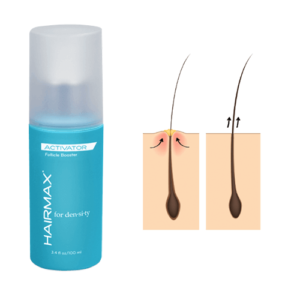 HairMax’s Activator can be used in conjunction with their laser devices, but also with other hair loss treatments. One of the possible causes of hair loss is one’s diet and nutrition. It is true that some vitamin deficiencies can lead to thinning hair, and thus vitamins can help support other hair growth methods. While vitamins alone probably won’t speed up hair growth, there are hair growth supplements that work to boost hair follicles. Hair regrowth supplements work by using your body’s own biological mechanisms to promote hair growth. HairMax’s dietary supplements contain biotin, which help produce keratin, as well as niacin, which helps improve blood circulation on your head. It also contains DHT blockers, and MSM, which promotes healthy collagen and keratin. Hair fibers are fantastic instant solutions to cover up thinning hair or patches. You simply spray or apply them on the area of your head that you want to cover up, and the fibers statically cling to existing hair. For the best natural-looking fibers, HairMax’s hair fibers provide a dramatic increase in density and volume to your hair whenever you need it. Perfect for both men and women, these fibers are the perfect temporary solution when you’re treating your hair loss with laser devices. Laser devices are effective but they do work in a gradual process. If you’re looking for a quick and convenient solution, then these fibers are the perfect solution. There are many hair growth products available in the market. With HairMax’s laser devices, you can use any of these products to supplement the long-term treatment that will help you regrow your hair. When a man looks in the mirror and sees a thinning hairline, he loses two things: his hair and his confidence. A full head of thick, dense hair has always been connected with one’s youth and good health while hair loss has become one of the earliest signs of aging. For most men, the problem comes down to bad genetics, and there is very little one can do to cure baldness when it has already set in. Luckily, HairMax has come out with the Density Bundle – a surefire way to prevent male pattern baldness before it strikes. What are HairMax Density Bundle Features? The Density Bundle is the newest HairMax product which is both quality and cost-efficient. This fantastic money-saving kit has all the things every man needs for a complete hair transformation. It comes with not just one but three products: the shampoo that is clinically proven to treat thinning hair, a condition that nourishes and hydrates your hair, and a powerful revitalizer that exfoliates your hair follicles. An innovative formula that contains powerful DHT blockers and antioxidants to combat the early signs of baldness and hair loss. Unlike most shampoos, it is specially made with low PH levels so that it is gentle on the skin and scalp. It not only restores hairs but also enhances its volume and thickness for bouncier hair. As with other shampoos, it is applied and massaged into the hair and scalp. Rinse with warm water. Density conditioner is a perfect complement to the Density Shampoo. It is a lightweight formula that contains argan oil, moisture-locking polymers and several plant extracts to help hydrate hair by trapping moisture on the strands. For best results, it should be applied after shampooing and left to stay for at least two minutes before rinsing. A clinically proven treatment to help hair grow denser by effectively cleaning the scalp. A cleaner scalp prevents hair follicles from clogging, which is one of the leading causes of slow hair growth. It contains powerful exfoliants that cleanse dirt arising from sweat and peppermint extracts to make you feel fresh after every use. That should be used three times a week after shampooing. Rinse with warm water. If you’re one of the many men experiencing thinning hair or initial signs of hair loss, this is the right solution for you. 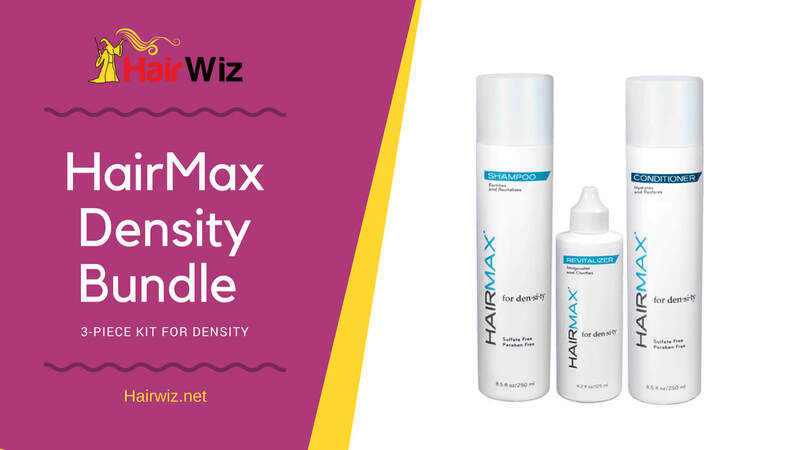 Unlike most products on the market today, HairMax Density Bundle is low in PH levels, making it a safe choice for those with more sensitive skin. While Hairmax Density Bundle promotes hair regrowth, it is widely used only as a preventive measure. Thus, it may not be the right choice for those suffering from extreme hair loss or are in the later stages of male pattern baldness. But if you’re looking for a fast solution for a thinning hairline or simply want to grow denser and more voluminous hair after a bad haircut, the Density Bundle is the best fix for you. Thinning hair is one of the earliest indications of male pattern baldness and is a problem that you should correct as soon as possible. 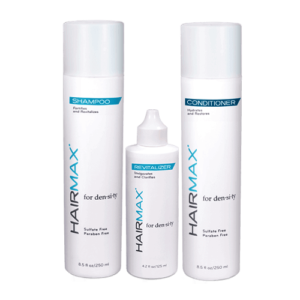 The HairMax Density Bundle offers the best preventive solution to this issue. It uses all-natural ingredients and has been clinically tested using the most innovative technology. There are many causes of hair loss, which include certain illnesses, effects or interactions of medication, hormonal imbalance, heredity, over styling, and nutrient deficiencies. To determine reasons for your hair loss, a doctor’s diagnosis must be made so you know which steps to take to treat your condition. Nutrient deficiency can be one of the leading causes of baldness for men and women. While you can acquire vitamins and minerals from the food you take, there will be instances when meeting the recommended daily servings can’t be met. And thus, dietary supplements are a must to support your goals of preventing hair loss and stopping further baldness or thinning of hair. The HairMax for Hair, Skin and Nails Dietary Supplement comes from one of the world leaders in the hair loss industry and is packed with all the essential nutrients you need to keep your hair healthy, thick, and your scalp free from bald spots. HairMax supplements are scientifically formulated by some of the world’s leaders in hair loss research. For years, the company developed and tested several formulations containing the best vitamins, minerals, and plant extracts to achieve the best supplements they could offer to support their other hair loss treatment products and to provide a supplement that could also provide overall health to support hair growth. HairMax contains the plant extract Saw Palmetto, which contains Beta Sitosterol, which has been known to reverse hair loss. DHT stands for dihydrotestosterone, which is produced from testosterone through the enzyme five alpha reductase. When DHT reaches your hair follicles, they kill the cells and eventually, the follicles die, and they stop producing hair, which causes severe baldness or thinning of hair. Biotin deficiency is known to cause hair loss. Biotin is essential for healthy skin cells, and when these cells are weak or inactive, your hair follicles suffer, and they tend to produce less hair or thinner hair, leading to thinning. Biotin helps to prevent this from happening and instead, promotes thicker hair strands, prevents hair loss, and promotes hair growth. HairMax provides 833% daily value of Biotin in one capsule. Niacin helps to stimulate hair growth, as well as minimizes cholesterol buildup. When cholesterol accumulates on your scalp, it is converted into enzyme five alpha-reductase, which converts testosterone to DHT. Niacin helps to prevent the protein from being made by keeping cholesterol at healthy levels, so they don’t affect your scalp. Niacin is also known as Vitamin B3 and allows for better blood circulation to your scalp and hair follicles. Each HairMax capsule provides 88% of daily value of Niacin. HairMax also takes into consideration your overall health by providing you with other necessary nutrients such as 67% daily value of zinc in one capsule, 100% of manganese, 500% of Vitamin B6, and 125% of folate among many other nutrients. HairMax dietary supplements are recommended for individuals whose cause of hair loss stems from vitamin deficiency. Diet plays a significant role in many medical conditions and hair loss is one of them, making dietary supplements a viable solution for this condition. However, if other factors cause your hair loss, HairMax supplements can only be taken in support of other treatments. It’s recommended for both men and women of adult age. If you are currently taking certain medications, or are suffering from a medical condition, it is best to consult your doctor before you start taking the supplement. The HairMax Dietary Supplements for Hair, Skin, and Nails are a great addition to your hair growth efforts. Full of essential nutrients that are made of all-natural ingredients with no risks for side effects. 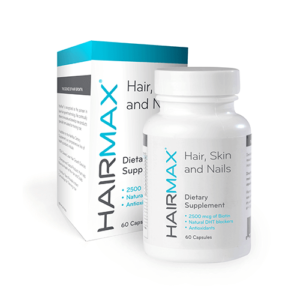 Preventing hair loss, supporting hair regrowth, and promoting overall health, HairMax dietary supplements are a must for healthy, great-looking hair, skin, and nails. Thinning hair is more than just a mere inconvenience – it’s a debilitating problem that affects your self-esteem, confidence, and your overall perception of your worth. An instant solution that covers up bald spots and thinning hair, HairMax Hair Fibers provides instant volume and thickness with keratin protein fibers that look like actual hair. You simply spray the fibers on any spot of your dry hair, and the fibers instantly cover up bald and/or thinning spots. They securely stay in place and cling to your already existing hair, and won’t come off until you use shampoo to wash your locks. The fibers are made of 100% organic protein that comes from the very same material hair is made from. That means that the fibers look natural on your hair, with no visible signs that you’re suffering from thinning hair or bald spots. The organic fibers are also safe to use, with no risk of hair damage. If you recently dyed your hair or if you have a particular hair color, then these options will allow you to achieve complete coverage without having to worry if the fibers look natural or patched on your hair. When you wear a wig or taupe, there’s always a particular fear that they would come off or move around, making you look silly. With these fibers, you won’t see them fading or coming off with perspiration or the wind. The fibers are charged with a certain level of electrostatic energy that allows for ultimate magnetic attraction to your existing hair, so you won’t have to worry about having a complete head of hair at the start of the day and bald spots when the day comes to an end. They cling effectively, so you won’t have to worry about the fibers coming off as you go about your day. Made of 100% natural organic protein which is safe on the scalp and your existing hair. Designed to look as natural as ever, as they are uniform in length, lighter, and softer compared to other similar brands in the market. Not ideal for large bald spots since the fibers need real hair to cling to. Does not work on wet hair – the static energy only works with dry hair. You can’t go swimming with the fibers on your hair unless you don’t mind looking bald or with a receding hairline as you get out of the pool or beach. The HairMax Hair Fibers are perfect for anyone who wants to have instant coverage of thinning hair or bald spots. You simply spray it on any area of your hair, where it instantly provides you with volume and complete coverage. They work on dry hair and can be applied in seconds, making it a great solution if you’re in a hurry and still want to solve a receding hairline. The Fibers are great to use for both men and women, and comes in 9 different hair colors such as blonde, medium blonde, black, gray, and others. For those who are going through hair loss treatments or even recovering from hair transplant surgery, the fibers are a great way to supplement your treatment if you want to have an instant solution while waiting for your hair to grow. The protein used in the spray are natural and organic, which means they won’t interfere with any treatments or have unpleasant interactions. The Fibers are not recommended for anyone seeking a long-term hair loss solution as this product is only meant for instant and immediate solutions to cover up bald spots. If your hair is completely bald, then there will be no existing hair for the fibers to cling to, so it becomes useless if this is the case scenario. 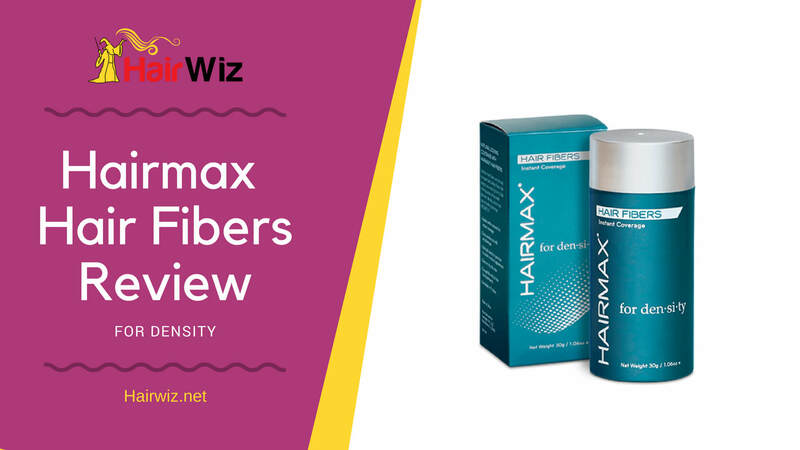 If you’re suffering from subtle bald spots or thinning hair but don’t want to go through the hassles and expense of long-term hair loss solutions, then the HairMax Hair Fibers is perfect for you. Just spray it on your hair and you’ve got instant hair that covers up your hair loss problems. They’re made of 100% natural keratin protein, making the fibers one of the most natural-looking in the market. If you do want to have a long-term solution to your hair loss, then other treatments must be done with the fibers becoming a supplementary solution. There’s a reason why a man’s hair is called his crowning glory. While women fuss over makeup, men’s image maintenance is concentrated mostly on their hair. More hair it means more masculinity. And while there are some who can rock the shaved head look, the reality is that it’s not for everyone. A dense, thick head of hair is one of the most desirable physical qualities in a man nowadays. So if you’re trying to figure out how to make your hair grow faster and thicker, the HairMax Density Activator is the best fix for you. In a nutshell, the HairMax Density Activator is a specially formulated serum to combat hair thinning and support hair growth. It is called an “activator” for a good reason: it activates the nutrients in the roots to boost hair follicles, helping your hair grow faster. Each package includes one 100ml bottle of serum. Using this product is as simple as parting your hair and applying the serum on the scalp, particularly on the part suffering hair thinning. Massage well and leave for one minute. Rinse thoroughly afterward, making sure the serum does not get into your eyes. It also comes in an easy spray bottle, making it a convenient choice for the gentleman who’s always on-the-go. Maintaining a clean scalp is important because it provides the best environment for hair to grow naturally. The HairMax Density Activator contains purifying nutrients to remove excess sebum and perspiration that clog up hair follicles and prevent hair growth. It also contains niacinamide to promote overall scalp health. Like other parts of the body, hair follicles need oxygen as well. However, unlike other organs, our bodies’ extremities are the hardest for oxygen to reach. HairMax Density is a unique peptide complex that improves circulation in the scalp area to make your hair follicles healthier. Why is this important? Stronger hair follicles mean that hair doesn’t break easily. It contains powerful antioxidants that restore your hair’s natural elasticity to reduce unwanted breakage. Like most products that cater to hair regrowth, the results may vary depending on many factors, such as one’s age and metabolism. Nowadays, when hair thinning has become a common problem among men, the HairMax Density Activator is suitable for almost everyone. It provides an easy remedy to grow out healthy and thick hair, especially for those who are in a hurry for an event or otherwise. The product has no age limit and can be used by men young or old. It is specially formulated to address different causes of hair loss. So, whether your thinning hair is due to hormonal imbalances, nutrient deficiency, emotional stress, a bad haircut, or simply bad genetics, the HairMax Density Activator is the best go-to solution for you. Thinning hair may not seem like much of a problem now, but if left unattended, it could lead to extreme hair loss and even baldness. While it is very little, you can do when hair loss sets in, the key is in the prevention of the problem. 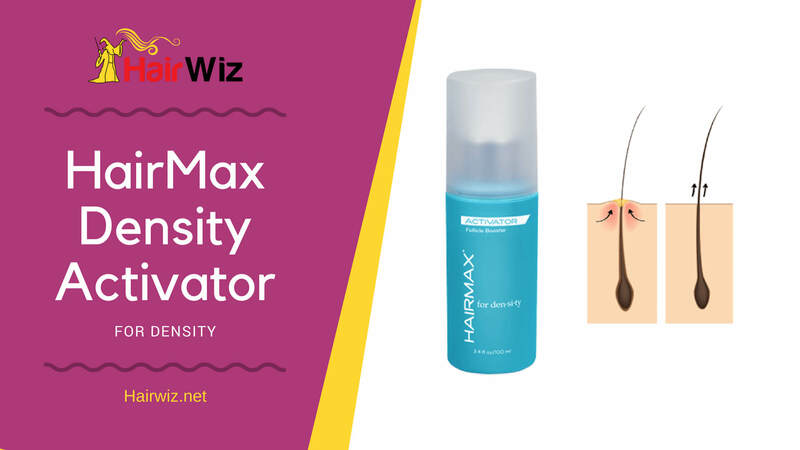 And HairMax Density Activator provides you with the best preventive solution in the hair care market today. By boosting your hair follicles and effectively cleansing your scalp, it helps them stimulate their natural growing process to give you healthier and more vibrant hair. Hair loss can be devastating on your self-esteem and confidence. It makes you look older than you really are and makes you look unhealthy – which can prevent you from forming or maintaining relationships, improving your career, and affects your level of happiness. So what causes hair loss and can it be prevented? By understanding the causes of hair loss, it will help you better understand the condition, the possible treatments to take, and what you can do to stop it from progressing. There are several reasons why you may be suffering from hair loss. It ranges from genetics to medicines you may be taking, to certain medical conditions you may have, as well as to emotional and psychological stress. Let’s understand each of these possible causes. Genes are one of the most telling factors if you’ll suffer from hair loss or not. If members of your family suffer from pattern baldness, then you have a risk of suffering the same fate. The most common cause of hair loss, individuals who suffer from female or male pattern baldness typically have parents or siblings who have the same condition. Male or female pattern baldness are the most common types of hair loss, which we will discuss later on. Changes in the body can cause your hair to fall out. If you recently suffered from a debilitating disease, or if you just underwent surgery, or if you suffer from an autoimmune disease, these medical conditions can severely affect your hormones, which in turn, can cause your hair follicles to stop growing. Sudden changes in hormone production such as during menopause and pregnancy, thyroid disease, arthritis, high blood pressure, as well as iron deficiency can all lead to baldness. Certain chemicals can alter hormone production, as well as cause inflammation to your hair follicles, causing them to stop growing, or permanently damaging them. Medications for cancer, arthritis, high blood pressure, heart problems, and even too much intake of Vitamin A can lead to hair loss. Other causes of hair loss include certain hairstyles such as pigtails and cornrows that excessively pull the hair tight, leading to damaged hair follicles. It could cause your hair to stop growing in certain areas, and even permanently destroy hair follicles. Hair loss caused by such hairstyles are called traction alopecia. Another cause of hair loss include trichotillomania, which is a disorder wherein a person habitually pulls his or her own hair until clumps of hair fall off. Over time, bald spots can develop. Stress can also cause hair loss as it changes certain chemicals in the body such as hormones and the production of neurotransmitters. Male pattern baldness is the most common type of hair loss for men. It starts with a receding hairline, which eventually creates an “M” pattern, until it forms a U-shape pattern on the hairline. Its cause is mainly hereditary and treatment can include transplants and prescription medication. Female pattern baldness, on the other hand, is not very much understood. There are no definite causes but it may be caused by aging, genes, and hormones such as during menopause, pregnancy, or after childbirth. Hair thinning typically occurs on the crown and eventually causes a wide gap between the hair’s center part. Female pattern baldness is permanent but can be treated with a hair transplant and medication. Also known as patchy hair loss, alopecia areata affects over 200,000 people in the US each year. It is characterized by circular bald patches that occur suddenly. Its cause may be brought about by stress, since the baldness occurs when your immune system attacks your hair follicles. Treatment can include topical scalp medication, steroids, and anti-inflammatory drugs. Effluvium means “outflow” and it defines the different phases of hair growth. Hair doesn’t grow all the time. It usually grows for about 2 to 6 years, then rests for about 2 to 3 months, falls off and new hair starts to grow. During the growing stage, which is called the anagen stage, it causes your hair to grow 1/2″ per month. During the telogen stage, your hair is not growing, which defines the resting stage. During the anagen stage (growing stage), however, not all of your hair is actually growing. About 5 to 10% of hair is on the telogen stage, which explains why you lose about 100 strands of hair everyday. When you lose about 300 strands of hair everyday, that means you may be suffering from telogen effluvium. This means that more than 5 to 10% of your hair is in the resting stage, which then causes baldness or the thinning of hair. Your hair may also have been on the resting stage but new hair hasn’t grown yet, revealing the patches of scalp where hair fell off. Telogen effluvium may be triggered by psychological stress, physical stress, iron deficiency, extreme weight loss or weight gain, surgery, and hormonal changes. Hair loss during the anagen stage of hair growth is sudden, quick, and devastating. You can lose a tiny patch of hair, or your head of hair entirely. The sudden shutdown of hair production is mostly seen in cancer patients who are taking cytostatic drugs, or those who have ingested toxic substances like rat poison. Cytostatic drugs prevent cell proliferation, which is great to halt the growth of cancer cells, but they also prevent cell proliferation of hair follicles. When individuals take these cytostatic drugs, they are freezing the hair follicles, which causes them to stop producing hair fibers, leading to extreme hair loss and thinning. The full effects of the drugs on your hair can be seen within two weeks but once you stop taking the medication, your hair will soon start growing again. Understanding the many causes of hair loss will help you understand why you, or someone you know is suffering from baldness or hair loss. Proper diagnosis, however, can only be done by a physician and if you wish to have proper medical treatment for your hair loss, consulting with a doctor is highly recommended. Doctors can rule out other underlying causes and help you find the best possible treatment methods for your hair loss.